Economists have forecasted a strong 2018 housing market with increased inventory and lower home price growth, and the November employment situation report from the U.S Bureau of Labor Statistics just may support their predictions. The report shows that total non-farm payroll employment rose by 228,000 jobs last month and that the market experienced continued robust growth in professional and business services, manufacturing and healthcare. The unemployment rate is at 4.1 percent, and the number of unemployed persons at 6.6 million, which is unchanged from October’s report. Economists were excited about the small gains in the residential construction sector, which took a small hit after Hurricanes Harvey, Maria and Irma redirected homebuilding efforts to repairs rather than constructing new for-sale homes. Realtor.com senior economist Joseph Kirchner, Ph.D., says the 4,000 new jobs in residential construction bodes well for the 2018 market and should provide the much-needed new inventory to temper home price growth. Fannie Mae chief economist Doug Duncan echoed Kirchner’s sentiments, saying that residential construction jobs growth provides momentum for the upcoming year. “Residential construction payrolls have posted healthy back-to-back monthly gains, hinting that residential investment will likely add to growth this quarter for the first time in three quarters,” said Duncan in an emailed statement. Meanwhile, NAR chief economist Lawrence Yun pointed out that residential jobs growth is still 20 percent below pre-recession levels, and may not yield inventory increase many are hoping for. In November the pool of unemployed individuals was unchanged at 6.6 million. The unemployment rates for adult men and women were at 3.7 percent. Teenager unemployment ticked up to 15.9 percent. 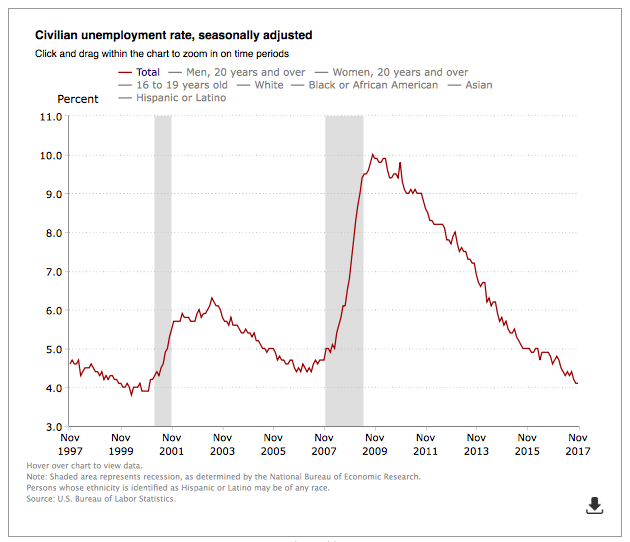 Black unemployment rates was at 3.7 percent, essentially unchanged from October. Asian unemployment was at 3 percent, essentially unchanged from October. Hispanic unemployment was at 4.7 percent, essentially unchanged from October. White unemployment was at 3.6 percent, essentially unchanged from October. The number of long-term unemployed individuals (1.6 million), the labor force participation rate (62.7 percent) and the employment population ratio (60.1 percent) all remain unchanged from October. Workers employed part-time for economic reasons — in other words, individuals who would prefer to find full-time employment — is unchanged at 4.8 million. Last month, there were 1.5 million people considered marginally attached to the labor force, meaning they are available for work and want a job, but are not currently in the labor force. The number of discouraged workers, who have indicated that they are not looking for work because they do not believe jobs are available for them, is at 469,000 — down from 591,000 in November 2016.